Ahoy! 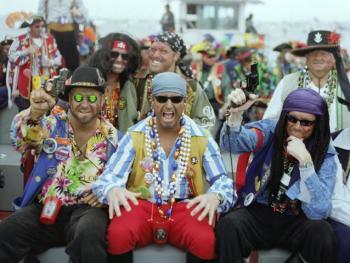 It’s National Talk like a Pirate Day! It’s the 11th straight year of celebratin’ public pirattitude around the world and no one understands pirates better than Tampa Bay! Tampa Bay is known for its annual Gasparilla Pirate Fest, and January 25, 2014 we will embark on a Tampa Bay celebration we have honored since 1904. The fully rigged Jose Gasparilla pirate ship will set sail in Hillsborough Bay, cannons a-blazing, guns a-flashing and a boat full of pillaging pirates. You don’t have to wait until the end of January to celebrate Tampa Bay’s pirate past. Avast! Talk like a pirate…… rock out like a pirate! In honor of this remarkable day and celebrating their title sponsorship of Gasparilla Pirate Fest in 2014, the Seminole Hard Rock Café in Tampa is hosting a Gasparilla Treasures Mixer from 4 p.m. to 7 p.m. There is no cover charge and there will be plenty of drink specials. We also hear some “popular pirates” may be joining in on the fun. What pirate doesn’t LOVE…… doughnuts?!? Walk into any participating Kristy Kreme and talk like a pirate and you get one FREE Original Glazed doughnut. If one just isn’t enough…. Fearless buccaneers who wear full pirate attire get the real treasure, one FREE dozen of the Original Glazed doughnuts.